Continuing the December Blog Carnival idea of putting a twist on things (the original post can be found here), this blog post is an idea for a campaign setting that puts a different spin on the transport circle; this idea will work best in a fantasy-style campaign where magic is available and their is some reliable means of magical transporting available, whether this be transport circles, portals or whatever, for convenience i’m going to refer to them as transport circles in this blog post. Background: Transport circles are one of the most convenient forms of transportation for those who have either the magical know-how or the money to pay someone who does, allowing for almost instantaneous transportation from one circle to another, no matter the intervening distance. Occcasionally people feel a little nauseous or dislocated for a few moments after transport, but it quickly passes and the effects are harmless. To the lay-person it seems as though powerful mages and articifers are capable of creating transport circles wherever they wish, however, the truth is a little more complex, normally the innate reality of the word resists transport magic, making it very taxing to cast such spells, however, there are spots in the world (that can be identified by the those with the appropriate arcane learning) where the reality of the world is weaker, allowing for construction of transport circles with far less effort and expense, large cities tend to build up around these areas as wizards and those seeking to benefit from the circles flock to such sites. The campaign begins: Below is the suggested sequence of events for a campaign using this model, feel free to intersperse events and adventures not related to this plot between the suggested points otherwise it will feel like everything is connected somehow to the transport circle and it may seem a little laboured or forced. Have a few adventures reference the use of transport circles in very minor ways, perhaps have the PCs use them or an ally use them, but make them seem very much like a convenient plot device or background element trying not to draw too much attention to them. A notable mage vanishes whilst attempting to create a new transport circle. If there are any mages in the party perhaps have them make a couple of rolls to determine some basic facts about transport circles, such as the weak points in reality that allow them to be easily constructed. Over the course of the next half dozen sessions a number of people are found brutally murdered and torn apart near transport circles. The bodies of the murdered people appear to have been slashed to pieces by extremely sharp and thin blades (infact two-dimensional claws). In the area where the murders took place, both existing transport circles and any magic dealing with transportation or planar travel is easier to cast and lasts for far longer (this is due to the fact that reality has been weakened by the appearance of the creatures from beyond the circles). The weakened points of reality that allow for the construction of transport circles are actually areas where creatures from another dimension have broken through into ours; normally these creatures do not appear in our world, however occasionally the conditions are just right (the stars align, ley-lines converge, or whatever is suitable for your game) to allow these creatures to enter our reality and hunt the people and animals that live there (whom they see as particularly favoured prey). When these creatures arrive they shred reality in the surrounding area as they pierce the invisible membrane between our world and theirs, weakening it to such an extent that magic can be used in our world to travel from one location to another. Messing around with transport magic in the areas of weakened reality eventually attracts the attention of the creatures who hunt, attack and eventually kill their quarry; inevitably the creatures will eventually catch wind of the PCs and will attack them. Unfortunately the creatures (which resemble two dimensional hounds made of shadow) are very difficult to destroy since they are capable of instinctively using transport circles themselves, however, any effect that prevents magic or stops a transport circle working binds them to our dimension for it’s duration making them easier to deal with. 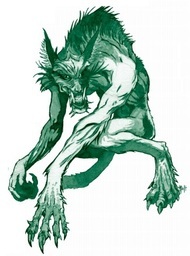 The creatures are intelligent hunters who are fully capable of withdrawing if they seem outmatched (aided by their ability to instinctively use transport circles or just fade back into their own dimenion) and using pack tactics; a party who believes they have successfully seen off the hounds may find themselves menaced again by shadowy creatures from transport circles in the future. Perhaps the PCs eventually find a way to enter the Hounds own dimension and take the fight to them or perhaps there is some way to poison/proof transport circles and magic against the attention of the Hounds.